The Narbonicon people made refrigerator magnets out of this image as a Narbonicon souvenir. 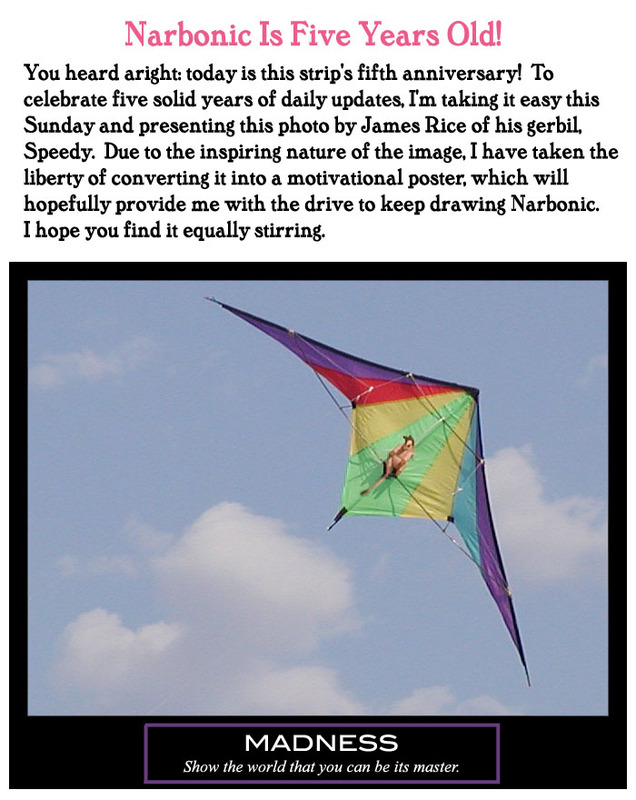 I still have my magnets, so I’ve looked at this photo a lot, and only now, writing this entry, do I have the distance and perspective to step back and say, “Holy crap, James Rice tied a plush gerbil to a kite.” That was actually a thing that happened. Continuing the Narbonic storyline cover series, here’s Joseph White’s cover for the opening storyline, The Job Interview. Joseph writes: The labels on the side say “Temporal Mechanics”, “Polymorphic Gender Dynamics”, “Cyberneurology”, “Thanatonautics”, and “Hamdingers”. Obviously areas of ongoing research at Narbonic Labs. Sadly, in the dark future of 2012, it’s impossible to take unironic motivational posters seriously again. Work together like a dream! Not a thing he wouldn’t dare! Gerbil Speedy! Never getting tired! All the readers by him have been inspired! Make me oh so glad! I remember that. Crap, it was a windy day, hard to keep the kite under control. Let’s take this time to review Speedy’s 2011. He started the year in Time Square New York. In February, he was back in Belize surveying caves. In April, it was surveying lava cave is the Mojave Desert for NASA. In May, He was a on a Mediterranean cruse, with a trip up the leaning tower of Pisa. In June, an Eight day expedition in Lechugilla Cave. September, he set a personal best ground speed in a car at 462 mph. December was the submarine ride, zip-lining, and a cruse through the Panama Canal. Not a bad year for a plush gerbil. @ Rachel S.: It’s not Radiation, it’s Biohazard. Biohazard, but with little hearts. That biohazard symbol rules.